FlipHTML5 is the professional PDF to HTML5 flipbook software that helps you to create and publish the digital flipbook in minutes. This flipbook software is developed with the powerful cloud publishing and managing platform which allows you to publish, sell, buy, share and manage the flipbook online. As we already enter the mobile intelligent fast developing century, people require more for the content digest. At the same time, the target customers can know your business through many ways. Thereby, you need to create the interactive content to keep the visitors attention and makes them your loyal users. 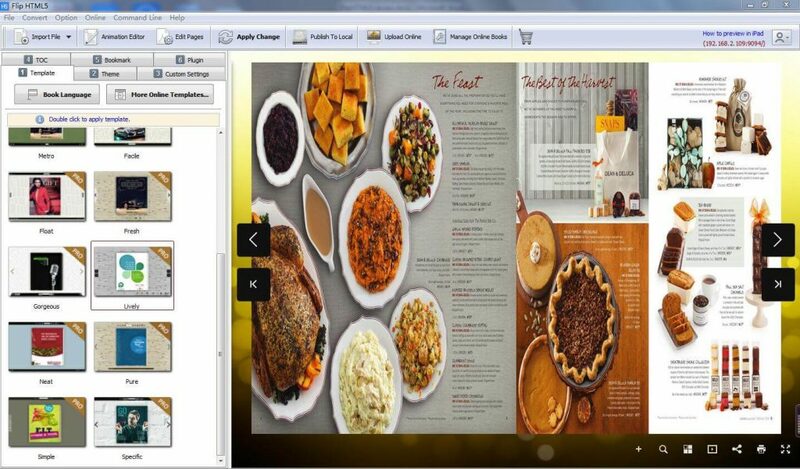 The PDF/ images are the basic information they can get from you. However, the flipbook can showcase your business in different ways with vivid images, videos, charts, links and more. It provides the more visual reading experience. There is an important factor that makes the flipbook popular. It is the mobile reading experience. Most of the flipbooks are online publishing and mobile friendly. It supports to read at anywhere without the software download. But it is static to view PDF/images on mobile. That’s what flipbook comes to our life. 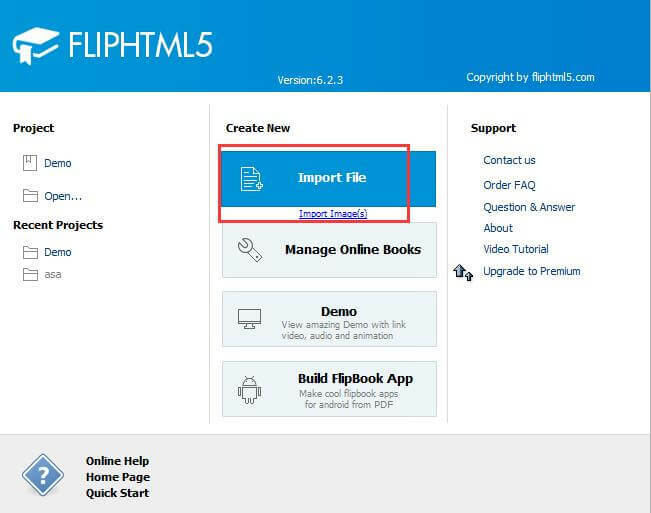 Step 1: Download and install FlipHTML5 desktop software on your computer. Step 2: Launch FlipHTML5 and Import PDF/images. 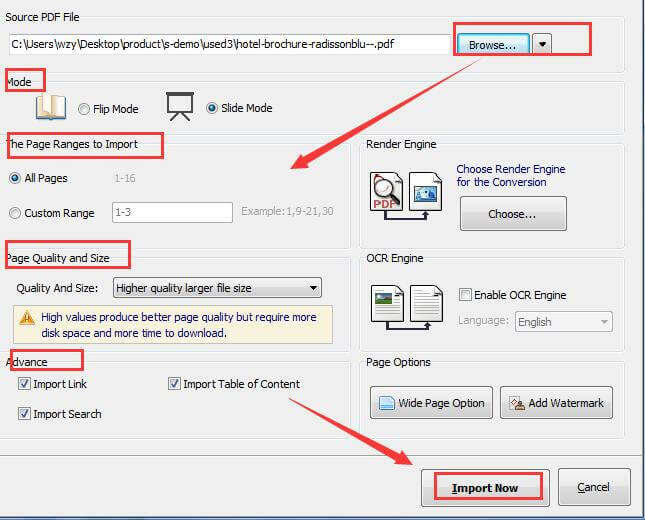 Step 3: Set the details to import PDF file. Step 4: Choose the template and theme. FlipHTML5 specially prepared a series of professional templates and themes for you to choose. And you can also brand the logo on the reading interface. Step 5: Add the interactive content. If you become the FlipHTML5 pro user, you can enrich the content with videos, images, links and more. Also, you can add the advanced action to make the content express more. It is easy without any coding process. Step 6: Publish to local or upload online. FlipHTML5 enables users to publish locally with follow formats: HTML, ZIP, EXE, Plug-in and Android App. Or you can publish flipbook to your site with the help of FTP. It is also possible to email to friends and customers. If you do not own a website, you can upload onto FlipHTML5 cloud platform for free. 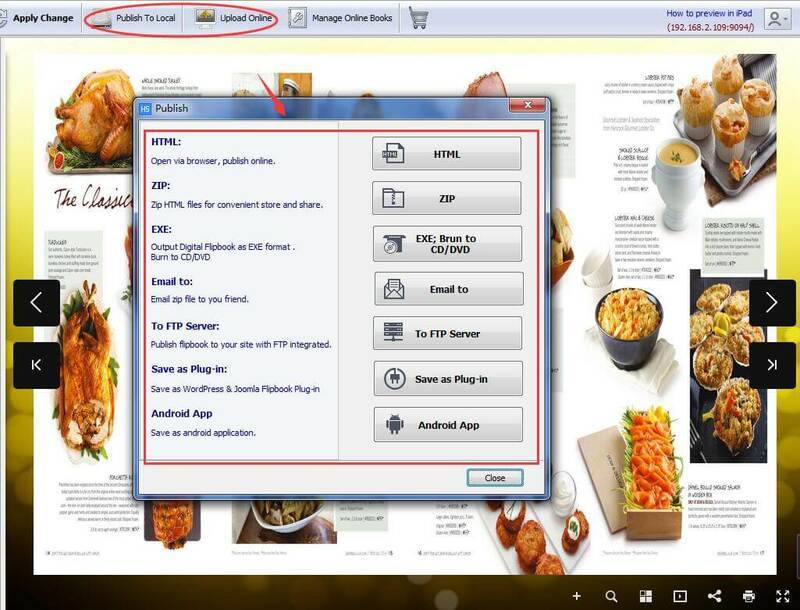 If you do not want to download the FlipHTML5 desktop software, you can directly upload PDF/images online. It takes you a few minutes. Step 1: Create an account and sign in. 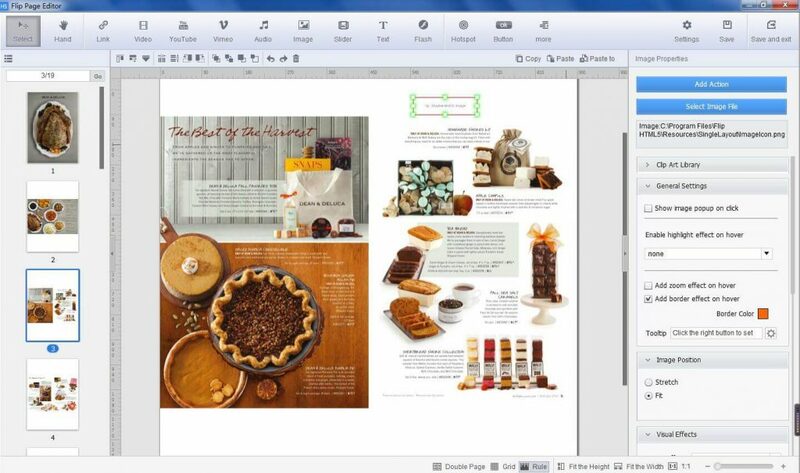 Step 2: Choose the document to upload and add the details for the flipbook. 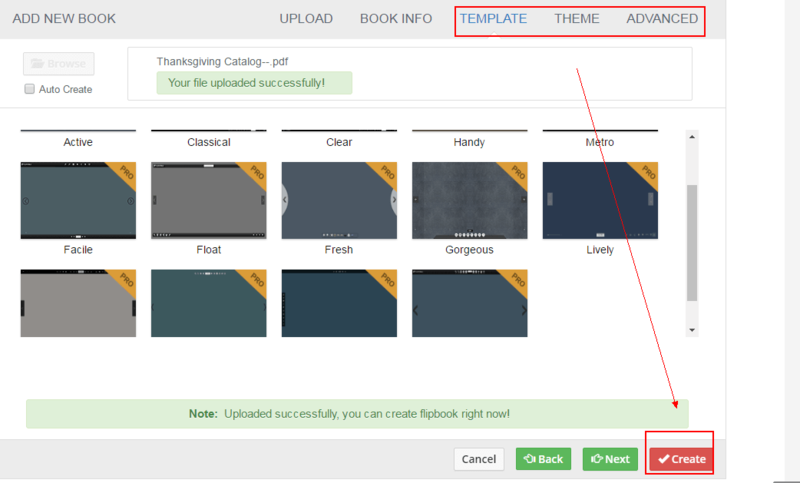 Step 3: Choose the flipbook template and theme. For the online design, you can also choose the template and theme. Besides, you can also brand the logo and enrich the content with various media. Step 4: Publish online and manage the flipbook. Once you create the flipbook, it will add into your collections. You can share it on social network; embed it on your official website or blog post or edit the text version for SEO. Besides, you have the option to set the selling options and privacy settings. FlipHTML5 also provides the online bookcase for flipbooks’ store and display. 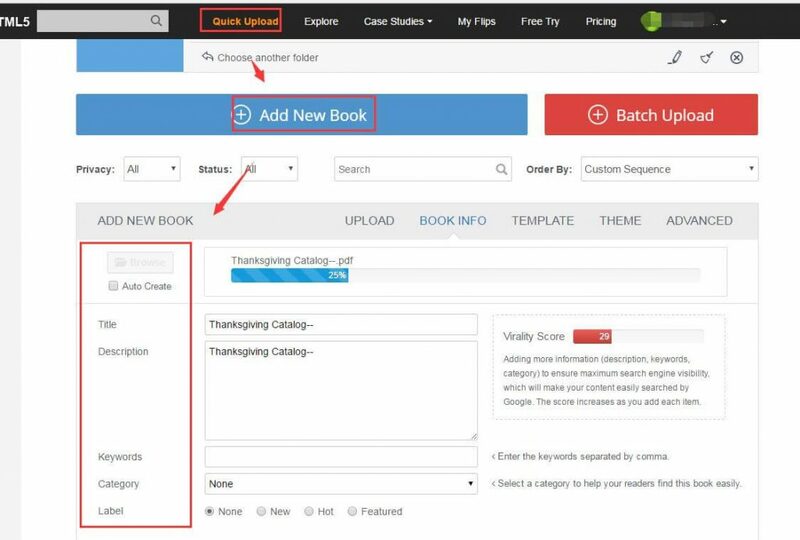 You are able to customize the bookcase settings. If you want to know more about the readers, you can get the flipbook access statistics online.